Michael Kimball: I’m curious about the way the title and author are presented on the cover. It’s not “Mira Corpora” and then “Jeff Jackson” as it is on the spine. 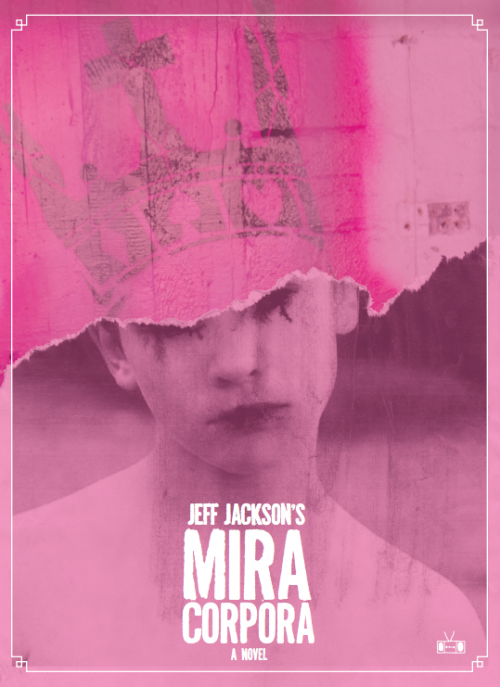 On the cover, it’s “Jeff Jackson’s Mira Corpora.” It’s something I’ve only seen with movie titles, I think, and I’m wondering how you decided on that particular presentation. Jeff Jackson: Two Dollar Radio was apparently inspired by movie posters when they came up with that presentation. There wasn’t any conscious strategy behind it other than to create something that stood out. I can see how it invites a deeper reading, though. Early readers have said the book’s prose has a cinematic quality (and I’m a huge cinephile) and putting my name before the title seems to reference that the narrator shares my name. Kimball: Right, the narrator is named Jeff, and you also are named Jeff. And, just past the title page and the copyright page, there’s an “Author’s Note” that says the novel is based on childhood journals. Given what happens in the novel, this author’s note becomes quite disturbing. I’m wondering, though, if the reader is supposed to take it as truth or read it as part of the fiction since it’s placed inside the boundaries of the novel. Jackson: I believe anything between the covers of a novel should be treated as fiction – whether it’s technically true or not. That said, the novel was inspired by childhood journals, but that inspiration was often very loose. Emotions were magnified to make them more legible. I allowed my imagination to get swept away by certain moments and to use previously existing images as springboards into entirely new scenes. I was aiming for an emotional honesty, but I wasn’t ever sweating the so-called facts. I included the “Author’s Note” to establish right away that the first person narrator is the same throughout the book – and he happens to share my name. I wanted readers to feel the pressure of a presence on the other side of the page. I was hoping that would establish some emotional stakes and charge the material. Calling attention to the writing process and the layers of narrative was also important to me. Kimball: The Author’s Note does introduce multiple ways to read Mira Corpora and it does create a strange tension that runs through the entire novel. There was always a question in my reader’s mind about source vs. imagination. But let’s move on to a different structural element. There are three brief sections – “I Begin,” “I Continue,” and “I End” – the longest of which is just over a page. Each of these sections is presented in italics and each of them references or discusses writing in some way. And those three sections seem to be a precursor for the last section of the book, “Mira Corpora (my first fiction).” Could you talk about the function of those three brief sections and how they lead to the “fiction” of the final section? Jackson: I thought of these short sections as poetic invocations that add a different texture to the book and reinforce the presence of an author. Initially these pieces exist outside the main story – though they echo things that happen within it – but toward the end, they make a direct appearance. The borders increasingly blur. Hopefully, these short invocations prepare the reader for the last section where the narrator picks up a pen and transforms his experiences into a short story. His “fiction” is meant to evoke themes and images we’ve seen previously while partly erasing what came before. For me, all these sections orbit slightly outside the rest of the book while still contributing to its overall gravitational field. Kimball: Right, the novel begins with the “Author’s Note” and ends with a fiction within the fiction (which, by the way, gives the novel a satisfying ending in a way that I wasn’t expecting, which I’m saying that way so I don’t give away any spoilers), so maybe I’m taking us in a little interview circle, but why did you decide to keep reminding the reader about the writer? And what is gained by calling the last section of the novel a fiction within something that is already labeled as fiction? And how does it partly erase what comes before it? Jackson: One of the book’s themes is how you transform parts of your life into fiction. I was interested in letting that happen on multiple levels at once and allowing the reader to see it happening. I like layering stories – I probably got a taste for that from the plays I’ve done, where several actions often unfold on stage at the same time. I’m really glad the last chapter was satisfying. For me, it partly erases what came before by offering a new version of familiar events. You close the book having just experienced a different arc than the rest of the novel – one that rearranges its themes. I think the stories we tell, especially about ourselves, tend to be very fluid and unstable. Reminding the reader about the writer was my way of keeping that idea in play. I wanted this material to complement the body of the story, which aims to be more emotional and visceral. Kimball: I like that bit about layering stories and that coming from the plays you’ve written. In what other ways has playwriting informed what you did with Mira Corpora? Jackson: My plays usually straddle the line between theater and performance art. The words are just one part of the overall “text” – sometimes the sound, lighting, and/or video elements drive the piece more than what’s being spoken by the actors. We work hard on the visual environment of the plays and that inspired me to think more visually throughout Mira Corpora and to be more aware of the spaces the characters inhabit. But the most important influence was probably in terms of process. We create plays over several years of intensive rehearsal and that helped me not to panic during the book’s long gestation. Theatre has also taught me to be fearless about revision. Before one nerve-wracking opening night, the director and I locked ourselves in a bar until dawn and restructured the entire play. And it worked – the piece was much better as a result! With Mira Corpora, I cut over 100 pages, went through countless drafts, and even created an entirely separate version of the novel. Kimball: I’m big on revision too, so I love this. Do you mind telling me about the entirely separate version of the novel? Jackson: The original version was much longer. It was made up of 35 short chapters that kept changing tone, point-of-view, and setting. I was way too ambitious about what I could pull off. I was asking readers to change gears too often – and for too little pay-off. There was also a lot of material that commented on the main text. Biographies of minor characters, lists of people who influenced the narrator but never appear in the book, secrets the narrator never shared with anyone. Ultimately that stuff was too self-conscious and clever and it had to go. I radically re-envisioned the novel. The opening section of the original version is now the last chapter of the book! Kimball: I’d love to hear one of the secrets the narrator never shared with anybody. Jackson: I’ll trade you for one larger secret: That original narrator no longer exists. I created him because I felt like I needed some distance – maybe even a protective layer – between myself and the material in the journals. He was a sort of mask I wore while writing. But as I revised the book, I became more comfortable with the stories I was telling. The narrator began to morph and I understood him well enough that he earned the right to my name. The mask I was wearing slowly became my face.